Galley Wench Tales: Discovering Oldest US Lager – in the Caribbean! in the Caribbean Virgin Islands. It’s thirsty country here in the Caribbean. We’re always on the lookout for the cheapest acceptable refreshment we can find. In the Virgin Islands, the cheapest beer we found was Shaefer, which bills itself as “The oldest lager in the United States.” Only, neither Wayne or I ever heard of Schaefer before. I figured they were taking advantage of what I was guessing are laxer laws on product claims. I was wrong! Thanks to the wonderful world of Beacon internet access, I discovered Schafer’s claims are indeed accurate. 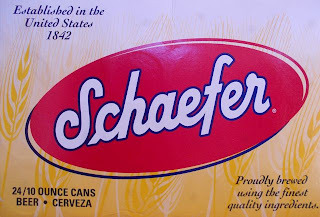 First produced in in New York 1842 by the F. & M. Schaefer Brewing Company, Schafer introduced lager beers to the United States. Amazingly, according to Wikipedia, (click here for Schafer wiki link) until the mid-1970s, Schaefer Beer was the world's best selling beer before ceding the top spot to Budweiser. In 1981 Schaefer Stroh Brewery Company bought Schaefer, and in 1999 Pabst Brewing Company acquired it when they bought out Stroh. Of course, both Wayne and I grew up on the West Coast. Schaefer’s is an East Coast beer; no distribution where we hailed from, in the Pacific Northwest, (click here to learn more about Schaefer’s history and distribution). Wiki says the advertising slogan for Schaefer beer is "Schaefer is the one beer to have when you're having more than one." Considering that most beers come in 12 oz cans, and Schaefer comes in 10 oz cans, and it’s cheap, yeah, on an 80 degree day, it’s a bit more likely you’ll drink more than one. Schaefer’s alright. It’s a light lager, similar to a Bud or a Michelob. Honestly, if all things were equal, I’d rather drink a 12 oz natively produced Carib. I just find it funny Wayne and I discovered “the oldest US lager” in the Caribbean Virgin Islands, rather than the continental United States. Travel is all about discovery, I’m just learning more than I expected in the Caribbean about food from home. Likewise! Preferably with some tastier than Schaefer.